City Law School PhD student Julia Constantino Chagas Lessa reports on the Seventh Annual Maritime Law and Policy Postgraduate Research Conference. 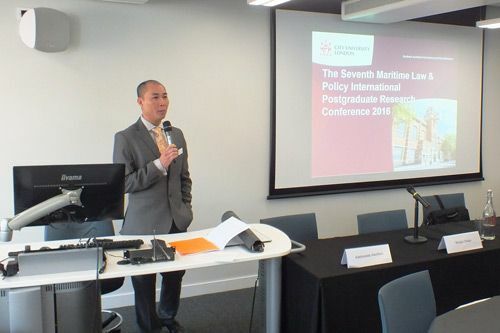 On 29th April 2016, The City Law School and the London Universities Maritime Law and Policy Group (LUMLPG) hosted the Seventh Annual Maritime Law and Policy Postgraduate Research Conference. The annual conference provides an opportunity for young academics to present their research papers in a supportive and collegiate environment, and is usually attended by students, academics, maritime lawyers and industry professionals. 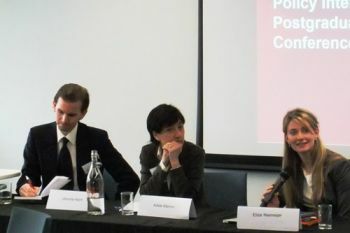 One of the main features of this annual event is to be able to follow the progress of some of the speakers’ research, who often attend the event more than once. University of Southampton PhD candidate, Debo Awosefo, is a good example of this. She has been presenting at the LUMPLG conference for the past three years, allowing the audience to trace her steps in Sustainable Development research into the International Maritime Organisation (IMO) and Shipping. Like the 2015 conference, the one-day event was held in the Northampton Suite and was divided into six sessions with corresponding themes. These were ‘The Regulatory Challenges’; ‘The Sea as Context’; ‘Risk Allocation – Comparative Law Analyses’; ‘Maritime Transport Planning; ‘Oil and Gas Challenges’; and ‘Contractual and Commercial Challenges’. Three PhD students from City Law School presented their research. First year PhD student and City Law School LLM alumni, Amar Vasani, presented a well received paper titled, ‘A Whistle-Stop Tour of Events which Affected 20th Century Shipbuilding Contracts most markedly, which took the audience into a historic journey into shipbuilding contracts. Shengnan Jia’s research enlightened the audience about the differences in Security on Property in Charterparties in Civil and Common law countries, with a paper titled ‘Security on Property as a Contractual Remedy in Charterparties: Common Law and Civil Law Perspectives’. Minli Tang’s presentation demonstrated how economics and law have an intrinsic relationship, being one often dependent of the other with her presentation was entitled ‘Debt/Equity Financing and Their Interaction with Law in Global Upstream Offshore Oil and Gas Projects”. This year’s event was partially sponsored by Routledge Publishers. Routledge has formed a partnership with the LUMLPG and offers valuable book discounts to the members of the group. A Charterparty is a hire or lease contract between the owner of a vessel (aircraft or ship), and the hirer or lessee (charterer). Under a charterparty, a vessel is rented (in full or in part) for one or more voyages (voyage charter) or for a fixed period (time charter). Normally, the vessel owner retains rights of possession and control while the charter has the right to choose the ports of call. Also called charter agreement or charter contract, and written also as charter party.